This was an absolute showdown of a match, and this could be seen in the first couple seconds of the first match. All players with a ball in hand stood motionless waiting someone to make the first move. It was straight out of a Clint Eastwood Western. You could even see a tumble weed roll across the court with the classic whistle audio track in the background. But once the first ball was thrown by the Badger, all hell broke loose. Balls went flying, people were getting pegged, relationships were tested, and friendships were shattered. Just kidding, everybody still loves everybody. 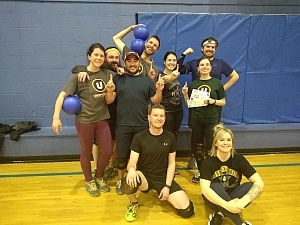 It was a tight match that with the turning point coming from Julia from Gotta Catch'em All making a catch that turned a 5v3 into a 4v4 that ended up winning the whole thing as a result. What a spectacular match and I couldn't have been happier watching these professionals do what they do best, slingin' foam balls at the speed of light. Great Job Everyone! It was a most excellent season!